This is top-quality, deep-pile, luxuriously soft faux fur imported from France. The tan faux chinchilla fur has been combined different ways, with solid velvet and with a rich brocade. 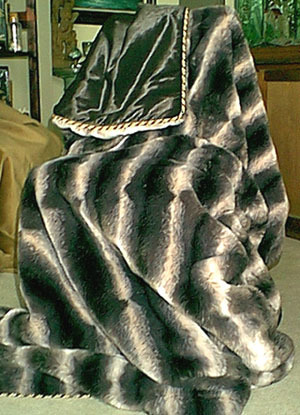 Soft, deep-pile faux chinchilla fur also comes in gray tones with a touch of brown. Here, it is combined with shimmering brown faux seal fur. This fabric looks like gray snakeskin, but there's a surprise. It is a very soft velour. 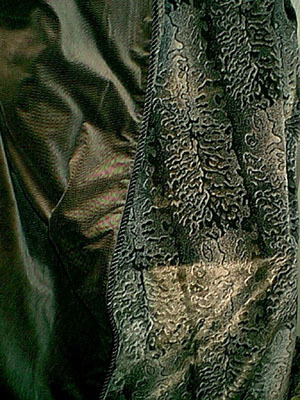 The Snakeskin lap robe is lined with gray herring bone velvet. 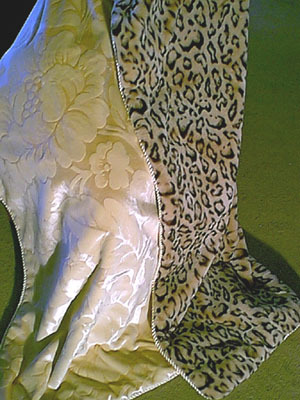 This striking faux leopard print is backed with creme velvet with a subtle foliage design. Palazzo features wonderfully soft, brown faux sable fur, realistically done with subtle black stripes and tiny guard hairs. 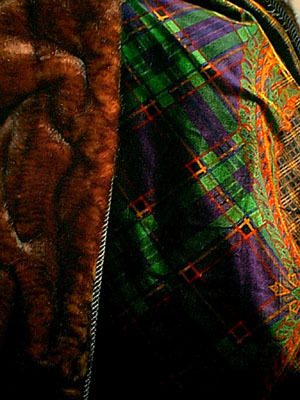 The sable is combined with a lavish Italian silk velvet panel, two yards long. The multicolor velvet design has elaborate stylized floral filagrees against a background of gold and black plaid. The Cheetah print on faux fur is combined with a beautiful beige foliage-patterned velvet and finished with a light gold braided cord. 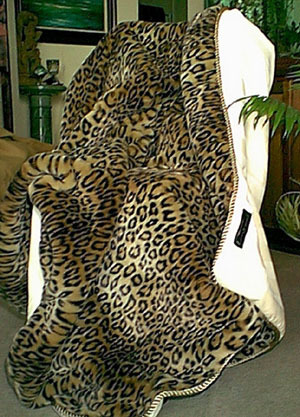 More photos of animal print faux fur designs are coming soon.